Baking is a chemical process that should be approached with the same accuracy you would use in a chemical laboratory. The correct ratio of dry to wet ingredients is crucial for achieving the right consistency in the professional-quality baked goods sold in your bakery. Dry ingredients are commonly measured inaccurately, simply because of the nature of many dry ingredients. To measure dry ingredients accurately, it is important to use a set of measuring cups specifically designed for dry ingredients. These cups have a very thin ridge around the top, without a pouring spout, which enables professional bakers to level the dry ingredient with a flat utensil. For dry ingredients that tend to clump or become packed down, such as flour or confectioner's sugar, it is recommended to fluff or sift the ingredient before measuring. Most bakers measure by weight rather than by volume, as this provides the most accurate measurement possible. Use a digital portion control scale that measures in grams to ensure that your measurements are perfectly accurate each and every time. Liquid ingredients are an important part of professional baking because they instigate the chemical reactions that will take place within the dough or batter. It is just as important to ensure that liquid ingredients are measured accurately as dry ingredients. Use a high quality liquid measuring cup set that features a thick lip and a pouring spout. These features will ensure that no liquid will be lost while pouring it from the measuring cup to your mixing bowl or container. When measuring liquids, it is important to note the presence of the meniscus line around the edge of a liquid measuring cup. Because of the chemical properties of most liquids used in baking, the liquid will rise slightly along the edge of the cup and adhere to the surface of the measuring cup. You can easily detect a meniscus liine by holding the measuring cup at eye level. The outside edges of the liquid will appear higher than the liquid at the center of the cup. Make sure the lowest point of the liquid meniscus line is level with the measurement you desire. In a professional bakery, small measurements such as teaspoons and tablespoons are not often used. However, there may be instances when you will need to bake small portions or individual servings, and in these instances a set of high quality measuring spoons should be used. The best measuring spoons for accurate professional baking are made of high quality metal and feature a very thin, sharp rim to improve accuracy. 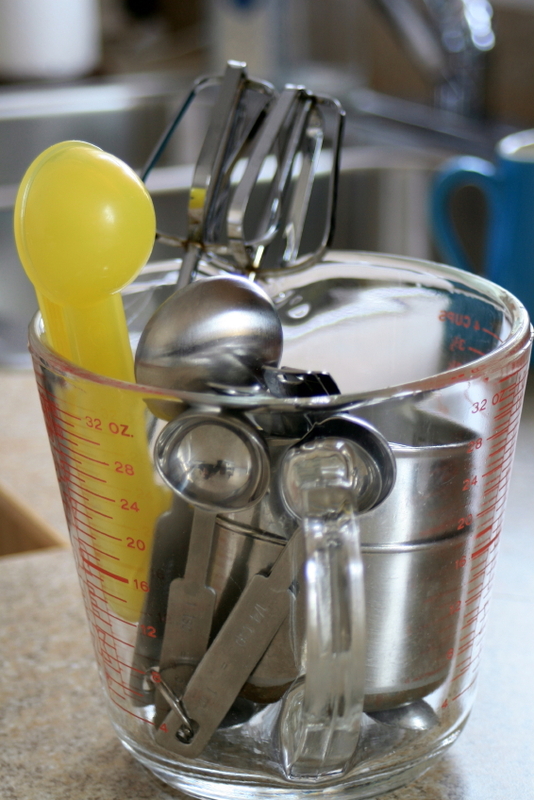 Plastic or rubber measuring spoons may become deformed or misshapen, which can affect the accuracy of baking measurements. If you are using measuring spoons to measure dry ingredients such as baking powder or baking soda, be sure to stir and fluff the dry ingredients to remove clumps and add air to the ingredient. By using these techniques for measuring dry ingredients, liquids, and ingredients in small quantities, you will improve the accuracy of your recipes and ensure that a high quality product is achieved every time.